There is no denying that Marvel is a modern cinematic force of nature. Through film after stupendously successful, box office-dominating film such as those of Thor, Captain America or Iron Man or the grandaddy of them all The Avengers, the studio begat by Stan Lee’s sprawling comic book empire has shown that it knows to how to tell a tale and tell it supremely well. And while all these films have, to some degree or another, possessed a passing sense of humour, a cheeky larrikin spirit or a winning way with throwaway quips, none of them have shown quite the gleeful, wanton and pleasing disregard for the conventions of the genre as the latest feather in Marvel’s movie-making cap as James Gunn’s Guardians of the Galaxy. 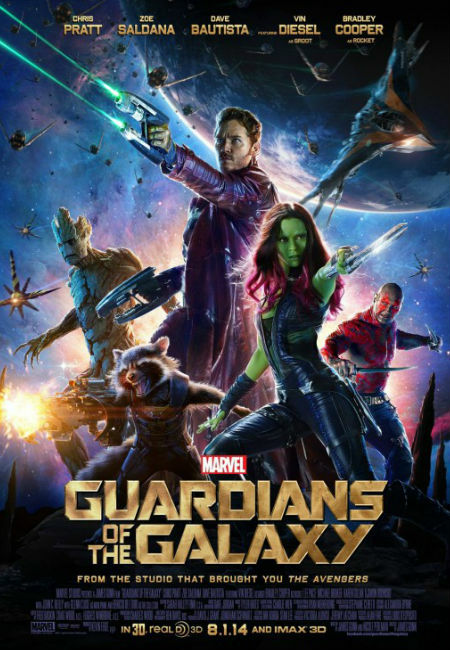 Granted it is not a complete departure from the usual self-interested misfits realise there is a cause greater than their own selfish interests and unite to save the world/galaxy/universe storyline, but what sets Guardians of the Galaxy apart is its willingness to have a huge amount of fun playing with those genre conventions, twisting them on their head in ways that po-faced, earnest Marvel, upholder of truth, justice and the superhero way, usually doesn’t countenance. The results are nothing short of hilariously extraordinary, rendering this oddball child of the Marvel Cinematic Universe as a film that is as happy to celebrate the bonds of unexpected friendship and camaraderie, of tenaciously standing against implacable cruel evil, as it is to mercilessly (and yet affectionately) lampoon the abilities, commitment and motivations of those inadvertently chosen by fate to act out roles normally occupied by the princely nobility of Thor, the gung-ho enthusiasm of Iron Man or the old-fashioned patriotic ardour of Captain America. That it manages to lampoon the swashbuckling action-hero genre even as it upholds it is an impressive feat, the credit for which lies firmly at the feet of James Gunn, a director and screenwriter who together with fellow movie scribe Nicole Perlman, has fashioned a film as comedically light on its satirical feet as The Princess Bride, another movie unafraid to have its storytelling cake and eat it too. 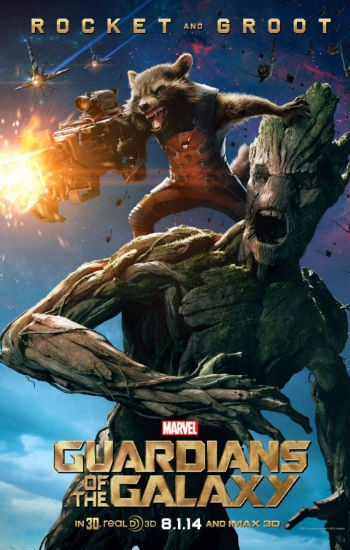 Together Gunn and Perlman have given glorious, joyfully funny, irreverent life to one of the lesser known Marvel properties, a series that began life in 1969, featured on and off in various incarnations until the 1990s, before being revived with the team we know from the movie in 2008-2010, and done it triumphantly. Set in a galaxy not that far away from our own, in fact one in which Earth is not just known about but has a reputation, Guardians of the Galaxy tells the story of the coming together of a disparate bunch of individuals, none of whom has any interest, at first, in being the saviours of anything but their own penurious bank balances. 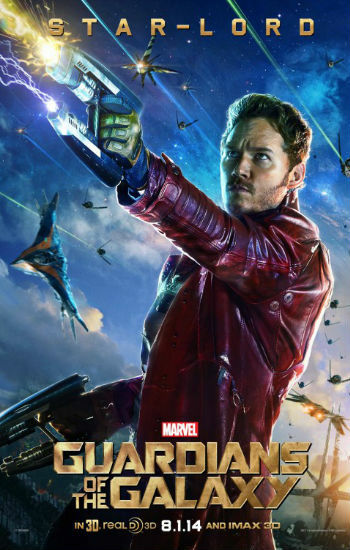 Peter Quill (Chris Pratt), a boy kidnapped from Missouri in 1988 by space pirates led by the blue-faced Yondu Udonta (Michael Rooker), is a devil-may-care acquirer of goods, journeying to far-flung remote parts of the galaxy like the abandoned planet Morag, in search of items required by his latest well-paying master-for-hire. Charming, handsome, and obsessively attached to the Sony Walkman he was carrying when abducted (one packed to the brim with classic ’70s tracks such as Redbone’s “Come and Get Your Love” which add musical lustre and form the soundtrack to this most unusual of Marvel creations), he considers himself a ladies man par excellence, happy to sleep with any woman from any planet that will have him. 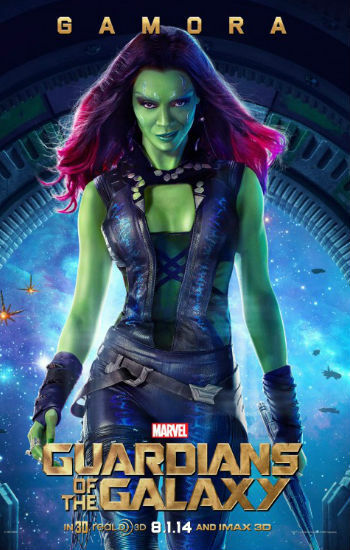 One woman impervious to his advances is Gamora (Zoe Saldana), the adopted assassin-looking-to-atone-for-her-sins daughter of Thanos (Josh Brolin), a big tall, menacing purple-skinned alien who wields immense power across the galaxy and to whom many, including the religious Kree fanatic Ronan the Accuser, the Big Baddy of the movie, look to for power and support. Together these two loners in search of a family are joined by feisty, opinionated, wise-cracking Rocket (Bradley Cooper), a cybernetically and genetically-latered raccoon. 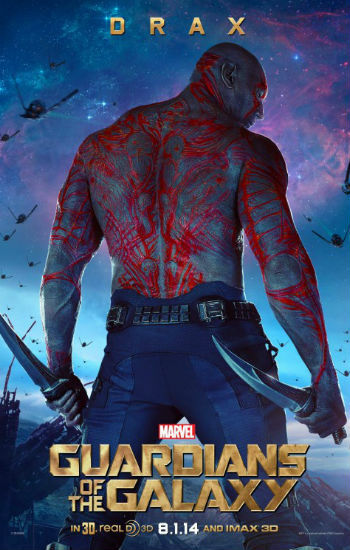 his bodyguard and loyal companion Groot (Vin Dissel) who evinces a gamut of emotions through the only three words he can speak “I am Groot”, and revenge-minded Drax the Destroyer (Dave Bautista), in the most unlikely grouping of saviours of the galaxy you have ever seen. The dynamic between the five self-interested characters is feisty, hilarious and intensely self-aware with each of them only along for the ride, at least at first, if they gain something materially-beneficial in return. What they gain of course as they attempt to stop Ronan from using yet another of the Infinity Stones – immensely powerful energy sources first seen in Captain America and The Avengers (the Tesseract) and Thor: The Dark World (the Aether) – to destroy the home planet of the Nova Empire, Xandar, are bonds of friendship and belonging so powerful and enduring that any deference to overriding self-interest is soon forgotten. What sets Guardians of the Galaxy apart from the usual well-meaning, clean-cut, if earnestly-enjoyable Marvel fare is that it goes about this epic, grand adventure with a messy, chaotic, cheeky and yes warm-hearted, intent that is a joy to behold. As the unlikely band of heroes journeys from one corner of the galaxy to another, from the prison complex of Kyln to the outlaw mining outpost of the Celestial Head to the glories of Xandar itself, all of which are rendered in awe-inspiring vivid colour, and attention to world-building detail, they bicker, fight, act selflessly and selfishly, perform noble feats and narcissistic ones, all attributes we’re not used to seeing in our usually flawless Marvel protagonists. But thanks to exquisite attention to character-building, which means all five of the main figures in the movie are given eminently relatable, three-dimensional senses of flawed self, fine acting by all involved, and witty, inventive script chock-full of laugh-out-loud dialogue, Guardians of the Galaxy nonetheless works brilliantly, delivering laughs, humanity, action and adventure, and genuinely affecting moments with effortless brio. Marvel is to be commended for not being enslaved to its formula, one that has by every conceivable barometer, been a spectacularly successful one for powerhouse studio, for being willing to take a chance on a scrappy, little known bunch of backwater individuals who race about the galaxy on their unexpectedly noble guest with such gusto, immense charm and good humour, so much so that Guardians of the Galaxy could well turn out to be one of the most successful, and original outings yet for the comic book juggernaut. Which in the grand scale of all things Marvel is truly saying something. Like all Marvel movies, Guardians of the Galaxy has a fabulous end credits scene, which in the spirit of the movie is gleefully, happily irreverent and well worth hanging around for. Once you’ve seen the film, check out this post at Screenrant which explains what it was all about and why it was included at the end of the film. Pingback: SparklyPrettyBriiiight | The Guardians of the Galaxy have never looked more animated!